A urine drug test for Fentanyl. It is designed to detect Fentanyl use and abuse from a urine sample. The drug test will give a preliminary result in just a few minutes. A test to detect drug residue. 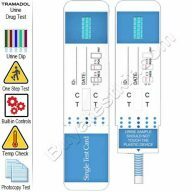 The fentanyl residue drug detection test kit is designed to detect and identify the Fentanyl using a PDT presumptive drug test technology. The drug test gives a conclusive result in just 60 seconds. Ketamine drug test kit. Its purpose is to detect the metabolite of ketamine found in urine. 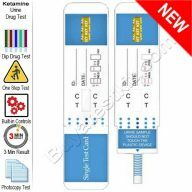 This test kit will tell you if you have been intentionally drugged with Ketamine and provide a preliminary result in just a few minutes if exposed within the last 72 hours. The product featured here is a urine drug test for four drugs. 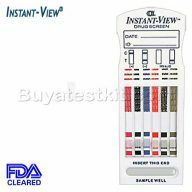 Commonly know as a 4 panel drug test ES it’s a fast acting one-step urine test gives rapid results with supreme performance conforming to strict cut-off levels for consistent reliability. This product is FDA cleared an CLIA waived. 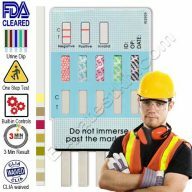 4 panel drug test kit detects four individual drugs in one test. One-step test for the detection of multiple drugs and metabolites in human urine with FDA 510(k) clearance and CLIA Waived. 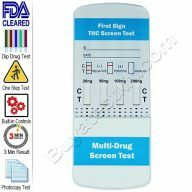 Multi-Level Marijuana drug test kit. A urine test that will tell you whether there is high levels of THC in your system, medium, low, very low or none at all. The solution when you need to see how much THC is in your body. Many people and for various reasons use these tests to see if they're positive for THC. 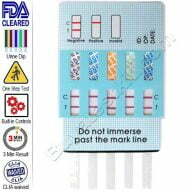 This product is a 5 panel drug test kit packed in fives (5). The package includes a CLIA waived 5 panel drug test, specimen cup with temperature test and 6 test adulterant check. Conforms to NIDA cut-off guidelines, FDA 510(k) cleared and CLIA waived. 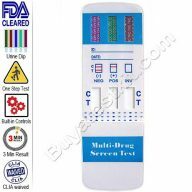 Three pack (3pk) 'drug test 5 drugs'. This urine test detects the five most commonly abused drugs in a one-step assay. It's the latest technology affording accurate and reliable drug screening and compares with a lab screen. FDA 510(k) cleared and CLIA waived. 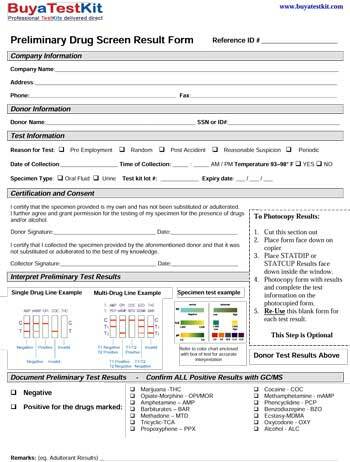 The employer 5-panel drug test pack listed here is recommended for testing employees in the workplace. It consists of a CLIA waived, and FDA cleared 5 panel urine drug test, a specimen cup, and a 6 test adulterant check. The perfect marriage for the employer. 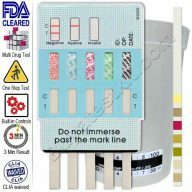 This product is a 5 panel urine drug test kit from Rapid Response. It's a urine dip test that detects five commonly abused drugs simultaneously. Its one-step operation produces results in less than three minutes. A very accurate analysis that ensures precise results with every test. 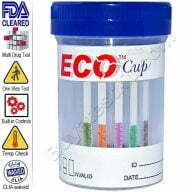 Possibly the most comfortable and economic 5 panel drug test cup kit available. This urine test detects five drugs and includes a specimen cup and a check for urine temperature. Its simple procedure requires no additional steps to activate it. Always follow the manufacturer’s recommendations to get the best from a drug test. “Don’t take drug testing lightly, as an individual’s credibility is at stake. More. Click Here to download a FREE copy.